Sodastream is facing some serious competition, what should their product managers do? 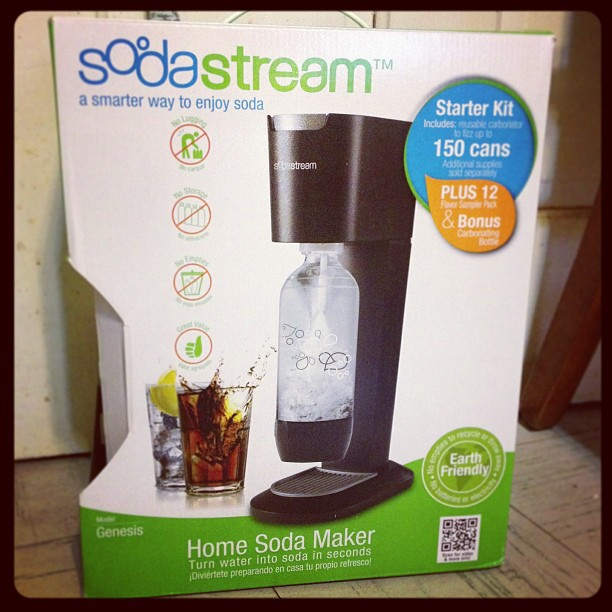 The good folks at SodaStream invented to “make soda at home market”. The way that their system works is that you purchase their soda making system. It comes with a CO2 canister and a set of sample soda flavorings. You add your own water, carbonate it, and then dump in some soda flavoring. Ta-da! You’ve just made your own soda at home for a much lower price and with very little waste. The SodaStream product managers created a simple and effective product development definition. The SodaStream product managers realize that the novelty of creating a soda at home will wear off quickly unless they find a way to keep their customers entertained. In order to make this happen, they’ve been focused on trying to come up with new flavors of soda that people can’t get anywhere else. In order to make this happen, they’ve hired a two-star Michelin chef (a very big deal) to create new flavors for them like raspberry lychee rose. The SodaStream product managers are not resting there. What they are trying to do is to take a look at their product, determine where it is difficult to use, and then take steps to eliminate those difficulties. One area that they’ve identified as causing their customers grief is the need to always be purchasing new CO2 cylinders. This is why they are planning on introducing a new service where a local vendor will visit customer’s homes and exchange new CO2 cylinders for used ones. Problem solved for the customer. This type of innovation always looks good on the product manager resume. SodaStream’s biggest problem is that they’ve been just a little bit too successful. What this means is that they have attracted some serious competition who are planning on launching their own at home soda making solutions in the near future. One of the best known names in the area of home brewed coffee, Keurig, is getting ready to enter into the home soda market. Just by themselves, Keurig would be a formidable competitor based on their success in the market for individual serving cups of coffee. However, Keurig has gone ahead and partnered with Coke-Cola which now makes them even more formidable. SodaStream is trying to fight back by introducing a novel new product that creates cocktails and another that can make hot or cold drinks; however, neither of these products will be available for several months. If the SodaStream product managers try to go head-to-head with Keurig and Coke-Cola, they’ll probably lose. Both of those firms have deep pockets and clever product designers. Instead, SodaStream is going to have to find a different way to present what their product can do and make it unique. To this end, the SodaStream product managers are in the midst of launching a “Waters Line” that consists of low calorie naturally sweetened flavors like “lime basil” and “yuzu mandarin”. The good news for SodaStream is that they have been very successful in the past. The bad news is that at least in the U.S., a lot of people are starting to drink a lot less soda no matter where it comes from. What the SodaStream product managers product manager job description tells them that they need to do is to find a way to reposition their successful product. SodaStream made their name by creating a system that made it easy for customers to create their own soda at home. However, their success has attracted other firms, including coffee maker giant Keurig and their partner Coke-Cola, to enter the market. This means that the SodaStream product managers need to move quickly and redefine their product in a way that the new market entrants can’t compete with. I believe that the SodaStream product managers have a good shot at being successful. They may need to consider renaming their product at some point in time if they stray too far from their roots. However, people are always drinking something and if SodaStream can convince us that their system makes it easy for us to create what we want to drink when we want to drink it, then they’ll do just fine. Question For You: Do you think that SodaStream should still offer soda flavors or should they exit that market?